All Posts Tagged With: "Vanessa Williams"
Iman and Vanessa Williams hit the red carpet at the launch party of their stylist, Sam Fine, for his DVD “The Basics of Beauty.” Plus, Vanessa reacts to being chosen as one of TV One’s hottest bachelorettes. Watch video (just click image below) by Access Hollywood of Sam Fine at the launch of his DVD, Basics of Beauty on June 18th 2009 at The Warren-Tricomi Salon at The Plaza! Sam Fine’s DVD Launch Party! Talking Makeup is glad to share with you some images from last night’s Sam Fine Basics of Beauty DVD event hosted by IMAN at the Warren-Tricomi Salon at The Plaza (June 18th 2009)! Everyone was sipping on NUVO sparkling Liqueur cocktails like the Iman Tonic, the Sam Fine Sparkling Sunset, and the Fine Basic Beauty (vodka on the rocks). 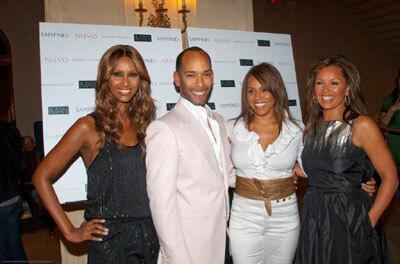 Attendees included Vanessa Williams, Deborah Cox, Taraji P. Henson, RuPaul, and Wendy Williams! Who Wants to have Lunch with Vanessa Williams? In honor of working women who have helped make BOTOX Cosmetic (Botulinum Toxin Type A) the most popular physician-administered aesthetic treatment for the last seven years, Allergan, Inc. just launched the “BOTOX Cosmetic: Express Success” charitable education campaign. Spearheaded by actress and singer Vanessa Williams, the campaign will benefit the not-for-profit Dress for Success, an organization that helps disadvantaged women succeed in the workforce, through a $250,000 donation from Allergan. Allergan is donating $2 to Dress for Success on behalf of each of the first 25,000 people who visit and register on the campaign Web site, www.ExpressSuccessCampaign.com click to Get Involved! When pledging support on the ExpressSuccessCampaign.com Web site, you also can enter to WIN a trip for two to New York City to have lunch with Vanessa Williams, read Vanessa’s personal blog as well as get interview and workplace tips. This is such am amazing opportunty!